First and foremost, Smart Boards are large enough for all students to see regardless of where their seat is in the class. We’ve all experienced sitting in the back of a classroom and struggling to see what’s on the board. But with Smart Board technology, the teacher can enlarge text and images as needed so everyone can easily see. Another key advantage of Smart Boards is that they are interactive and encourage active student participation. Teachers can invite students up, one-by-one or in groups, to use the board. Students can click hyperlinks, write directly on the screen with colorful digital markers, and use a variety of applications including graphs and interactive maps. Smart Boards integrate diverse technology like microscopes, calculators, mobile phones, and more! Rapid results and analysis: By using an audience response system, students can participate in online class surveys, quizzes, or games that are projected directly onto the Smart Board. Because the entire class can see the answers, students can immediately begin analyzing results. Going green: Schools across the country are going green and Smart Boards are helping by allowing teachers to ditch traditional paper handouts for electronic communication. This not only saves natural resources, but also time; teachers no longer need to stand at the copy machine hoping it doesn’t jam right before class begins. Global access: Smart Boards can bring the world to your fingertips. By using webcam technology to stream live video, students can interact with classrooms on the other side of the planet, scholars in another state, or even with astronauts in space. A fun way to start is projecting Google Earth and letting students “fly” to their intended destination. Creative fun: Get creative! New Bay Media’s Tech & Learning offers ten innovative activities for the Smart Board, such as an interactive flannel board for preschoolers. Included are click-and-drag games, graphic organizers, board games, and more. Students aren’t the only ones who benefit from Smart Boards. Teachers can learn and even get professional development hours by participating in online training and interactive tutorials. Many school districts now offer workshops where experienced teachers or computer experts teach the ins and outs of using interactive whiteboard technology. Smart Boards are aptly named. Studies show that when teachers use these interactive whiteboards, student test scores go up by 16 percentile points. Why? When students actively participate in their own education, they are more motivated to learn. Teachers can capture the attention of students with varying learning styles by creating lessons that are simultaneously tactile, auditory, and visual. 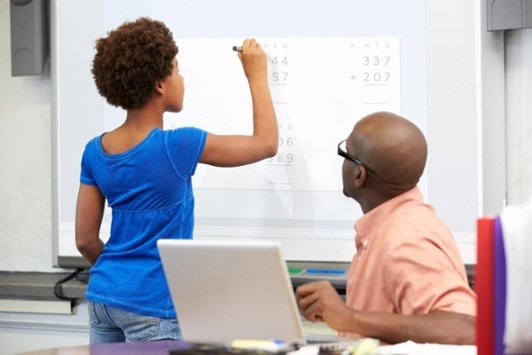 Simply put, Smart Boards are powerful tools for engaging students. Now that’s smart.